Backgroud The aim of this study was to identify the conditions that are associated with a better application of endoscopic thyroidectomy technique. 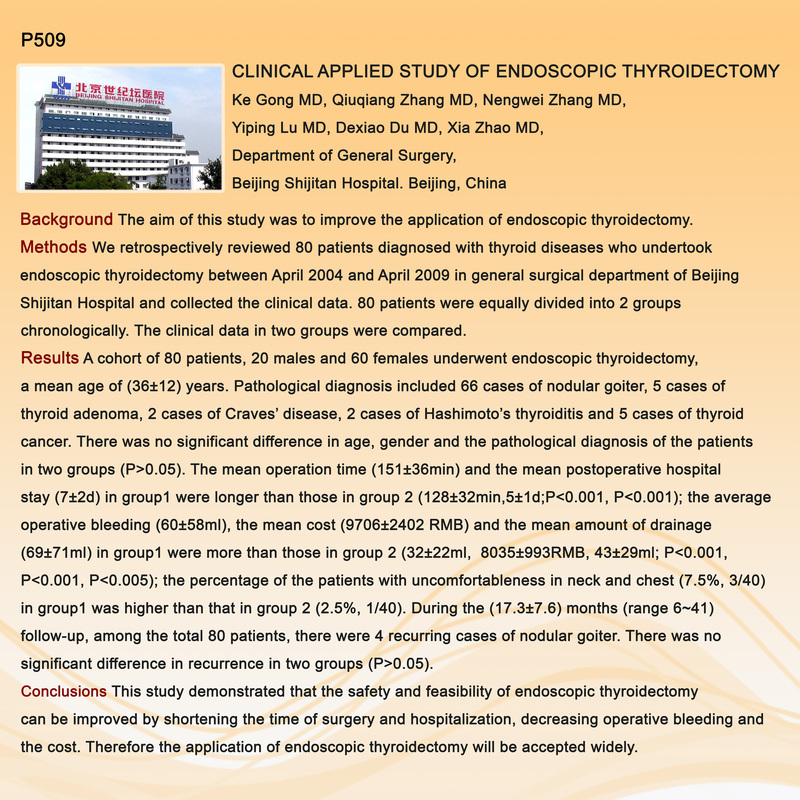 Methods We retrospectively reviewed 80 patients diagnosed with thyroid diseases who undertook endoscopic thyroidectomy in the general surgical department of Beijing Shijitan Hospital between April 2004 and April 2009. Eighty patients were equally classified into 2 groups chronologically. The clinical data in two groups were then collected and compared. Results Among the total 80 patients, 20 are males and 60 females with a mean age of (36±12) years. Pathological diagnosis found 66 cases of nodular goiter, 5 cases of thyroid adenoma, 2 cases of Craves’ disease, 2 cases of Hashimoto’s thyroiditis and 5 cases of thyroid cancer. There was no significant difference in age, gender and the pathological diagnosis of the patients between the two groups (P>0.05). On the other hand, the mean operation time (151±36.4min) and the mean postoperative hospital stay (7±2d) in group1 were found to be longer than those in group 2(128±32.4min,5±1d;P<0.001, P<0.001). The average operative bleeding (60±57.5ml), the mean cost (9706±2402 RMB) and the mean amount of drainage (69±71.2ml) in group1 were also higher than those in group2(32±22.5ml, 8035±993RMB, 43±28.9ml;P<0.001, P<0.001, P<0.005). The percentage of the patients with uncomfortableness in neck and chest (7.5%, 3/40)in group1 was larger than that in group2(2.5%, 1/40). The median follow-up period was 17 months (range 6~41 months). There were 4 recurring cases of nodular goiter. There was no significant difference in recurrence between the two groups (P>0.05). The serum thyroid-stimulating hormone (TSH), T3 and T4 of all 80 patients was normal at 6 months after surgery. Conclusions This study suggests that the safety and feasibility of endoscopic thyroidectomy can be improved by reducing the surgery and hospitalization time and also by decreasing the operative bleeding and therefore, the cost. Consequently the application of endoscopic thyroidectomy could be accepted more widely.